There is happy news going on at Lindsay Sews. About a year and a half ago, I received an email from Elizabeth asking whether I would be interested in being part of an online bee. Since Elizabeth and I had been emailing back and forth for while and I really loved all the things she was doing, I immediately said yes. When I discovered who the other bee members were, my first thought was, "Um, you know I'm old enough to be your mother just a little older than most of you, right?" Any misgivings were completed erased at the thought of being part of this group. I just knew it was going to be a good thing. Lindsay has worked so hard to make this book become a reality. And she is right when she says that this book is "celebrating the work of creative individuals! Quilting TOGETHER. Creative oneness. Coming together to do something that none of us could do on our own." And now, a year later, the book is available for preorder at Amazon! 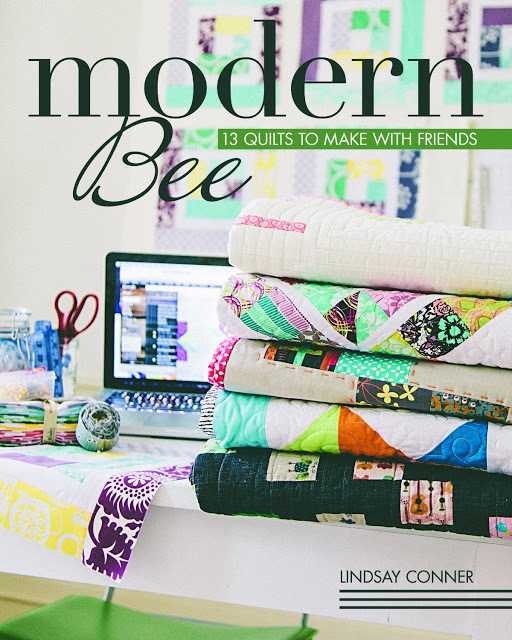 Modern Bee: 13 Quilts to Make with Friends will release October 1, 2013 (wow, that seems like a long time...) by Stash Books/C&T Publishing. Lindsay will be sharing more about the process later and I'll be sharing her links. In the meantime, she has set up a website where you can learn a little more about all of us. Go say hi to Lindsay. Really. She has a little giveaway going on, open until April 3. That's great news for you. Hope it is a bestseller! Way to go Cindy and friends! Can hardly wait to get my autographed copy! I wondered where all the new giveaway comments were coming from today! Thanks for sharing and most of all for adding your creative flair! congrats to you on all your hard work and contributions to this book. Must be fun to see your name in print. That is going to be fun. I can't wait to see the results. I love the cover photo! Makes me want to see more! How very exciting!!! Look forward to seeing the book. I'm sure it will be full of amazing quilts. Congratulations to you Cindy and your bee friends!!! Very exciting news! Oh, wow, Cindy! This is so cool! I'm so happy for you! Preordering my book now!